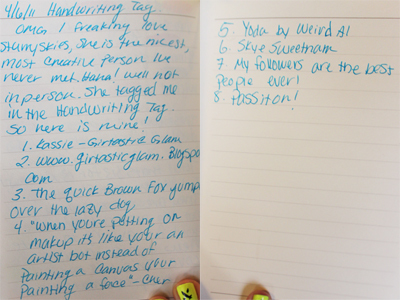 So StarrySkies214 Aka The Beautiful Like of The Girl Next Door tagged me in this Handwriting Tag, I was pretty fun so here we go! 1. What is your name? And your blog? 2. What's your blog URL? 3.Write: The quick brown fox jumped over the lazy dog. 7. Say anything you want. 8. Pass this along to a few bloggers. I would pass this on to other bloggers, but I would just end up passing it onto the same people Sonja picked haha! And NOW onto the HOLY GRAIL! The Holy Grail is this little black book that I write in, any and everything makeup related. I basiclly use it for brainstorming for my blog. I write down product lists, tutorial steps, Ideas, Things for my blog like Friday Features, Wishlists, swatches ect. This thing goes with me everywhere, I never leave home without it, haha. It's like my bible if I was religous haha. wow great idea , your blog is fresh , funny and so glamour really i like it , i m following you . OMG...great idea!! I freakin love it!! Along with your decorations!!! I'm so copying this idea. You're totally what I think of when I think about an artist (especially a musician) with that journal. Haha and a Weird Al song was totally not what I was expecting! This is a really imaginative tag!! Can I steal it? ?